The Lions football players aren’t the only ones doing the tackling at Ford Field. Over the last few years, the sustainability department has been tackling some extensive energy projects and the result is impressive for the 1,826,250 square feet facility that covers a 25-acre footprint in downtown Detroit. Heading the sustainability efforts at Ford Field Director of Facilities, Fred Reddig. Reddig was recently selected by Facility Executive magazine as the magazine’s 2017 Facility Executive of the Year. A well-deserved acknowledgment for the outstanding work his team has accomplished at Ford Field since 2014. Reddig entered the stadium into the Michigan Battle of the Buildings 2015. 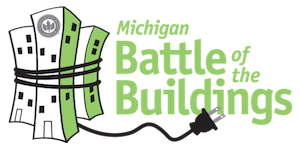 Michigan Battle of the Buildings is an energy reduction competition open to all commercial and industrial buildings in Michigan. It’s a friendly competition pitting building against building to see who can be the biggest energy loser over the course of one year. Ford Field has been a competing building in the energy reduction competition since. Each year, Michigan Battle of the Buildings hosts an Energy Summit to congratulate the biggest losers and bring buildings owners and operators together to share their energy reduction stories. In 2016 Reddig spoke on a panel at the summit. Along with other 2015 competitors, Reddig shared lessons learned by Ford Field during the competition year and gave insight to what they have planned for the future. Reddig works with the Green Team at Ford Field to establish best practices throughout the stadium. Moving forward, they plan to include the commercial real estate side of Ford Field, bringing their tenants on board with the energy reduction and sustainable practices they are developing. While much of the Green Team work happens behind the scenes a visitor at the field may notice the upgraded lighting. The lighting retrofits at Ford Field have been made possible by utilizing the incentive program offered by DTE Energy. So far, they have received $290,000 from the program. “We expect a 2-5 year pay off on our lighting projects depending on the location and how often they are used,” said Reddig. Retrofitted lighting to LED technology resulting in higher efficiency and better cooling properties. New building management software installed to control the stadium lighting and breakers. Variable frequency drives and controls were installed on city water booster pumps allowing better control and reducing energy consumption by two thirds. Improvements to the cooling towers and chiller plant contributing to two million gallons of water saved in 2016. Restoration of the roof – which enabled materials to stay out of the landfill. In 2015 Ford Field hosted twice the number of events than the prior year. Thanks to the energy reduction efforts of Reddig and the Green Team they did not see an increase in energy use. Congratulations to Ford Field and we look forward to following the work of the Green Team.